EZ-Flo Fertilizer EZ Injectors for Garden Drip Irrigation or Lawn Sprinklers inject any water soluble or liquid nutrient without pre-mixing. EZ-FLO 1010-HB. One Gallon hose bib system for constant pressure installations. 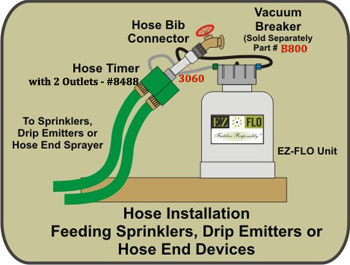 This system is the perfect choice to feed multiple zones automatically with a hose timer. All EZ-FLO equipment is designed to deliver virtually any type of liquid or water soluble product. Systems can be connected to a hose bib, a drip system or an irrigation system. EZ-FLO's patented technology can use fully concentrated liquid (no premixing required) or water soluble products and deliver them quickly or in small micro-doses every time you water, creating superior nutrient uptake and more beautiful results. This technique of applying products through the water is called "fertigation". Fertigation is a sustainable horticultural practice which has many environmental benefits, such as saving water and eliminating the pollution common with other methods of horticultural care. Do not install system in an irrigation mainline before a zone valve. Do not use if pressure exceeds 100 PSI. Flush hose after each use to vent chemicals and pressure. Empty tank when freezing conditions are present. Apply 3.5 lbs of 20-20-20 per 1,000 feet per week. Once you have fruit set, apply 5 lbs. per 1,000' of 16-3-26 with Calcium. ** If you are growing Tomatoes & Peppers, you should spray them every week with Calcium Chelate at a rate of 2 oz per 1,000 feet. REMEMBER!! More is not always better! I have killed more with fertilizer, than I have helped! *** Soil Tests are recommended. Ask your Local Extension Agent about leaf samples and soil samples. They can also make specific recommendations to your region. EZ-FLO studies have shown EZ-FLO units efficiently deliver even the heaviest organic products. The internal flow ports of the system are large and protected by a fine, non-clogging screen. This screen prevents downstream clogging in your drip emitters or spray heads. If the desired organic is oil-based (lighter than water), the unit may not be able to pull the mixture since the pickup tube pulls from the bottom of the tank. EZ-FLO Fertigation technology has been in development over the last ten years. As of 2007, EZ-FLO has received 9 issued US Patents and 2 International Patents covering its unique fluid flow technologies and has tens of thousands of units operating in actual field use. Our patents cover the connection couplings as well as the flow process whereby fertilizer is accurately proportioned in the tank cap for release to the irrigation water stream. One of the unique attributes of an EZ-FLO system is its ability to precisely proportion fertilizer concentrate into a water stream in an extremely accurate manner. We call this “Micro-Dosing”. Not only is the amount of fertilizer concentrate proportioned accurately but the individual fertilizer elements of N-P-K are also in consistent ratios when exiting the irrigation system from beginning of the fill cycle to the end of the cycle. Many people erroneously assume that fertilizer in the EZ-FLO tank is simply diluted as it goes through an entire cycle. However as can be seen above, dilution does not really occur in the way most people think. Almost all of the dilution occurs in the tank cap where we can control it and in the irrigation line where the nutrified water rejoins the rest of the clear water. EZ-FLO’s patented flow technologies effectively create an “invisible bladder” that separates the clear water entering the tank from the fertilizer concentrate at the bottom of the tank. As clear water is introduced into the tank, it arrives in a number of areas. Port water inlets at the top of the tank create a clear layer of water that separates it from the fertilizer concentrate. Additionally a micro-jet agitation nozzle at the bottom of the tank “gently” agitates the heavier fertilizer concentrate, keeping the resulting semi-dissolved solution at even chemical concentration levels leaving the tank. Because of this ‘invisible bladder effect” there is no real dilution of the suspended N-P-K in the tank through out most of the tank cycle. Only when you get to the end of the tank contents do the NPK percentages fall off. As shown in the graph under the table, EZ-FLO technology results in a level application rate and there is no concentration/dilution “spike” as occurs in other proportioning systems that have direct mixing of fertilizers with water. EZ-FLO secured the testing services of the JR Peters Laboratory (a Scotts Miracle-GRO Company affiliate) to document the consistency of the N-P-K release using EZ-FLO technology. The result of this independent lab testing is shown graphically above during the “full to empty” cycle. As can be seen, there is no initial spike in parts per million (PPM) as occurs with other mixing systems. Additionally the N-P-K parts per million remains relatively constant until the tank evacuates at the end of the cycle. Only then, do the parts per million fall off, but that is in the last 5-10% of the cycle when the tank is almost empty of fertilizer concentrate. WHAT PRODUCTS CAN I USE WITH THE SYSTEM? Any liquid or water soluble powder may be used in the system. Water soluble powders do not need to be dissolved to work in the system. The EZ-FLO process dissolves, mixes, and measures for you. If your product is clear you must add food coloring or dye so the product will be visible in the clear output tube. HOW DO I KNOW WHEN THE FERTILIZER IS GONE? When the system is operating (water flowing) the clear tube will fill with the color of your fertilizer. When the systems is operating and the tube is running clear, the system is out of fertilizer. MY FERTILIZER IS GONE BUT THE TANK IS FULL OF WATER The EZ-FLO system will always be full of fluid since it replaces the product with fresh water utilizing a patented process to layer the incoming water over the heavier fertilizer solution. This process is similar to oil on water or whipped cream on gelatin. HOW DO I KNOW THE SYSTEM IS WORKING? When water is flowing through your garden hose or drip system, the color from the fertilizer will completely fill the clear tube. The color depends on the fertilizer or dye color. The color in the tube may be lighter or darker depending on how much fertilizer was put into the tank and/or the injection setting selected on the cap. If you have a full tank of fertilizer and do not see color in the clear tube, refer to the Installation and Flow Requirements sections of this guide. MY SYSTEM IS RUNNING BUT THE LINE IS STILL CLEAR •First check that your system has water flowing and is not just under pressure. The tube will only show color when the water is flowing. •Make sure the tank was filled with the proper amount of fertilizer and dye was added if the fertilizer did not contain a dye. Also, confirm all air was removed from the tank by topping off with water. •Check that the included hose bib injection fitting is installed according to the Installation section. You may need to rearrange your filter, pressure regulator, and/or timer so our injector fitting is last. •Check the Flow Requirements section to determine if you need a Flo Disc or that the correct Flo Disc was selected. •If installed in a sprinkler line adjust the ball valve connector (CBV) according to the instructions provided with the connector. If the system was installed in a sprinkler line and a coupling ball valve (CBV) connection was not used, one must be installed for proper function. MY SYSTEM IS FEEDING TOO FAST Check that you have selected the appropriate feed setting. Also, if you used a Flo Disc during installation, make sure the proper disc was selected. Any Flo-Disc will speed up the injection rate of the system. If using a coupling ball valve connection (CBV) for irrigation pipe, make sure the valve is properly calibrated. Opening the valve will slow the feed rate for your system.